Description: Black plastic set of 4 stacked "sewer-line" pipes with a lifting hook on the top. Measures 1-1/8" wide, 2-3/8" long, 1-3/4" high (including loop on top). Description: Small round black suction cup with a round connector knob on top. Measures 1" diameter. Description: Square brown plastic "wood-slat" sided crate that has a lifting hook molded onto the top. 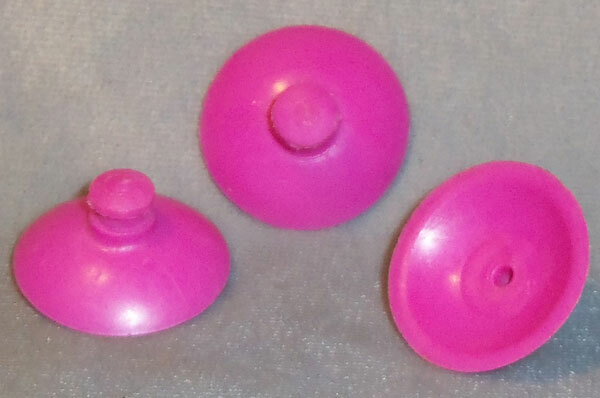 Description: Small round hot pink suction cup. Description: Red hinged gripper assembly with a metal bolt in the center that allows the gripper to open and close to grab objects. Measures about 2-1/2" long. Description: Red stairway with 3 steps. The steps have a narrow base with 3 steaps that are wider than the base (steps hng over on sides). Description: Tan fabric parachut with military green camouflage designs. The parachute has plastic tangle free wires and a harness for a Construx figure. Description: White plastic rectangular boat hull that really floats. The boat does not have seats, nor a steering wheel. The front of the boat has an area with raised lines on top, and the body and back of the boat are recessed about 1/2" down from the front and side edges. The back does not have an edge. The boat has an orange 4-stripe decal on the back 2 sides (*decal may be missing). When the boat is flipped over, the bottom side has a level surface to built Construx objects on the lined "pattern" on the bottom. Description: Round white glow-in-the-dark saucer that can be used as a frisby. There is a connector hole in the center of the frisby, and 4 connector holes on the sides. The top of the frisby has molded panels that resemble panels on a spaceship. Description: Yellow plastic rectangular boat hull that really floats. The boat does not have seats, nor a steering wheel. The front of the boat has an area with raised lines on top, and the body and back of the boat are recessed about 1/2" down from the front and side edges. The back does not have an edge. The boat has an orange 4-stripe decal on the back 2 sides (*decal may be missing). When the boat is flipped over, the bottom side has a level surface to built Construx objects on the lined "pattern" on the bottom. Description: Long yellow construction bucket that can be used as a scooper or dump bed on a construction vehicle. The bucket has ridges on the sides and 7 rounded connector holes across the top of each side. Each end side has 1 rounded connector hole across the top. Description: Yellow jointed arm that is hinged in the middle to bend. Measures about 3 " long x 1/2" wide x 1/2" deep.